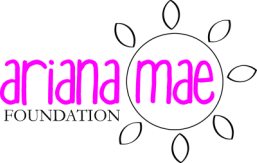 The Ariana Mae Foundation is a local 501(c)(3) non-profit created in loving memory of our daughter, sister, granddaughter, niece, cousin and friend, Ariana Mae Lusis, that offers compassionate financial assistance and kindness to bereaved families after the loss of a child and to those raising children with life-threatening conditions. We proudly support the Sudden Unexplained Death in Childhood (SUDC) Foundation, an organization dedicated to increasing awareness of sudden unexpected deaths in childhood, funding crucial research into the causes and prevention of SUDC, and advocating for the needs of families affected by these tragedies. To learn more about SUDC, please visit www.sudc.org. We also support the Dravet Syndrome Foundation in honor of Ariana's brother, Harper, whose mission is to aggressively raise research funds for Dravet syndrome and related epilepsies; to increase awareness of these catastrophic conditions; and to provide support to affected individuals and families. Please visit www.dravetfoundation.org. Please note that currently, financial assistance is limited to families living in the state of Michigan. The Ariana Mae Foundation proudly supports the Sudden Unexplained Death in Childhood Foundation (SUDC) and the Dravet Syndrome Foundation.